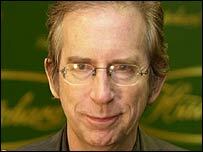 Two-time Man Booker Prize winner Peter Carey is one of the 19 authors longlisted for this year's prize. The Australian author, who previously won the prestigious literary award in 1988 and 2001, is considered for his latest novel, Theft: A Love Story. Kate Grenville, Sarah Waters, Howard Jacobson and David Mitchell are among the other nominated writers. A shortlist will be announced on 14 September, with the overall winner revealed on 10 October. The 19 books were chosen from 112 entries - 95 submitted and the remainder called in by the judging panel. "We've tried to be careful and critical judges as well as being passionately involved," said Hermione Lee, this year's chair. The author and academic said the panel were "delighted with the variety, the originality, the drama and craft, the human interest and the strong voices in this longlist". "It's a list in which famous established novelists rub shoulders with little known newcomers," she continued. "We hope that people will leap at it for their late summer reading and make up their own shortlist." Poet and novelist Simon Armitage, novelist Candia McWilliam, critic Anthony Quinn and actress Fiona Shaw make up the 2006 committee. Last year's Booker was won by The Sea, by Irish author John Banville.